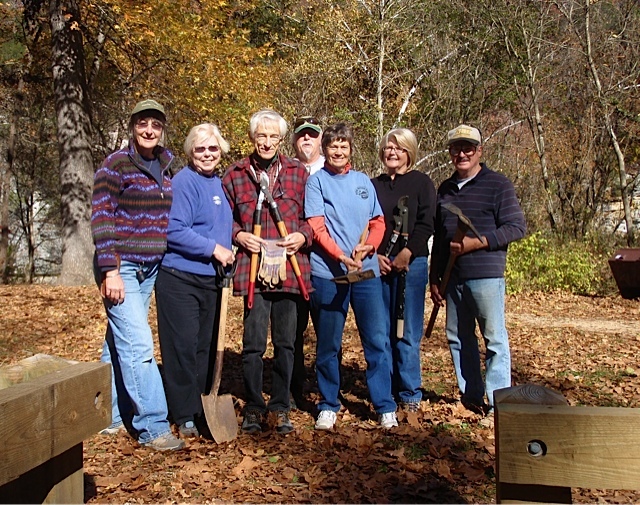 On the sunny autumn morning of November 7th, seven volunteers gathered at Pruitt to help CD Scott of Buffalo National River remove the invasive rose of Sharon, Hibiscus syriacus, from areas near the native and globally threatened Alabama snow-wreath, Neviusia alabamensis. Alabama snow-wreath is native to only a few southeastern US states. Rose of Sharon, not native to the US, has been listed as invasive in the states of KY, PA, TN, and VA. It spreads by suckers and seeds, and is of little use to wildlife. However, as settlers brought the plant into this area, it is considered to be of “cultural significance.” Therefore, using pruning sheers, pickaxe, and saws, we removed rose of Sharon only from areas where it was crowding Alabama snow-wreath. Where stumps were too large to dig out, CD sprayed them with the herbicide, garlon. Plenty more rose of Sharon exist and are spreading in nearby natural areas along the riverbank, but the Alabama snow-wreath has been given space to thrive for a few more years. 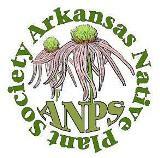 Represented among the Buffalo National River Partners volunteers were members of Arkansas Native Plant Society, Arkansas Audubon, and the Ozark Society. Report and picture submitted by Pam Stewart. This entry was posted in Community Event. Bookmark the permalink.